The wireless anti-theft alarm can know the specific location of the alarm through multi-zone display, and is suitable for enterprises, public institutions, financial systems, business places, schools, etc. The choice of siren sounding time: This function can set the length of time when the siren sounds。 the police alarm is called when the siren is in the start mode. The time can be set to 1~30 minutes, and the big 30 minutes is the always sounding mode. 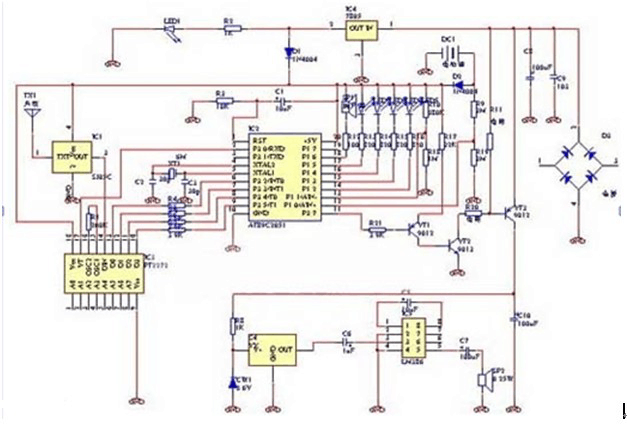 It mainly consists of wireless receiving, data decoding, data processing, alarm circuit, output display, power failure alarm and power supply circuit. The receiving frequency of the whole machine is 315M, and the data decoding uses the PT2272 dedicated decoding chip which is used more in the market, and the reliability and stability are better. Delay arming: The user can set a certain time for the host to automatically arm, the delay time is: 0-99 seconds. Delay alarm: The user can set a certain time for the host to delay the alarm. The delay time is 0-99 seconds. Wireless control, easy to install, no construction wiring, high sensitivity, strong anti-interference. This wireless alarm host can be applied to any wireless probe with a transmission frequency of 315M and encoding with PT2262, such as wireless human body detector, wireless magnetic sensor, wireless microwave detector, etc. Due to the different environments used, the settings required for the host are different. Users can use different software to achieve different functions according to their own development. Previous Post: What is Reflow Soldering and Wave Soldering?